Tokyo, September 4, 2015 --- Hitachi, Ltd. (TSE: 6501, “Hitachi”) announced today, the development of artificial intelligence technology (henceforth, AI) which provides appropriate work orders based on an understanding of demand fluctuation and on-site kaizen activity derived from big data accumulated daily in corporate business systems, and its verification in logistics tasks by improving efficiency by 8%. By integrating the AI into business systems, it may become possible to realize efficient operations in a diverse range of areas through human and AI cooperation. With the progress in information technology (henceforth, IT) in recent years, IT systems have been introduced into various business systems to achieve work efficiency. In the future, it is expected that taking factors such as daily demand fluctuations and changes in accompanying on-site responses on a daily basis, will become increasingly important in raising work efficiency. Conventional business systems however operate on preprogrammed instructions, and therefore in order to reflect on-site kaizen activities or employee ingenuity it is necessary to have a system engineer redesign the system, making it impractical to frequently update the system. Further, there was also the issue that in the event of a non-standard operation becoming necessary, it was also necessary to rewrite the work process and design, thus making it difficult to issue efficient work instructions in a timely manner for changes in demand fluctuation and corresponding on-site changes in response. Although workers on-site conduct tasks based on work orders issued by business systems analyzing big data such as those related to work details or results, in order to conduct the tasks efficiently, workers also devise and implement new approaches and kaizen drawing from experience. The AI automatically analyzes the outcome of these new approaches, and selects processes which produce better results and applies it to the next work order. By understanding and applying the ideas of on-site workers and their kaizen activity to work instructions on a daily basis, it is possible to create an environment where humans and AI mutually cooperate to continuously raise efficiency. 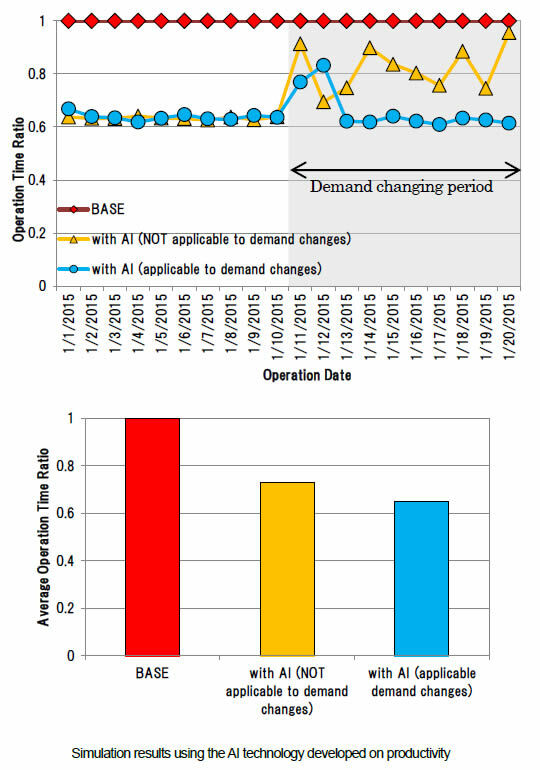 When developing conventional business systems, expected busy or off-peak season related demand fluctuations are taken into consideration in the design but this has not been able to accommodate for short periods of bad weather or sudden increases in demand. The AI automatically selects and analyses data similar to the actual work conditions of the day from past big data on work detail, work volume and weather, to provide appropriate work instructions in response to short period of bad weather or sudden changes in demand. Business systems accumulate big data in various alphanumeric forms including symbols, such as amount, time and product codes. Thus, in order to analyze this data with AI, it was necessary to have a domain expert in the business task pre-analyze the data, making data analysis even more time-consuming. The AI analyzes the statistical distribution of the data, and by automatically pre-categorizing the data notation format, enables new data to be integrated quickly without assignment by a human interpreter. As a result, it becomes possible to automatically incorporate daily kaizen by employees or demand fluctuation into the system to produce appropriate and timely work instructions. To verify the benefits of the AI, an on-site demonstration with a warehouse management system equipped with this technology was conducted, measuring item collection efficiency in a distribution warehouse. Comparative results of a warehouse system with and without this technology, showed an 8% decrease in work time based on instructions issued by the system with this technology. In addition to logistics, Hitachi intends to apply the AI to various other areas such as finance, transport, manufacturing, healthcare, public works, and distribution, in order to contribute to business operations which can respond flexibly to changes society in an efficient manner.